Ionic Trace Minerals are a highly bio-available liquid ionic form trace mineral concentrate from the Great Salt Lake in Utah. They are the strongest and most concentrated mineral supplement from an organic source you can buy that we know of. They are nature’s full spectrum, highly concentrated blend of ionic minerals that match the bodies systems. These minerals are 99.5% sodium-free with the remaining mineral nutrients concentrated to over 50 times that of ordinary sea water. What are Liquid Ionic Trace Minerals? Your cells depend on minerals for proper function and structure. Minerals are needed for proper composition of body fluids, the formation of blood and bone, and the maintenance of healthy nerve function. Like vitamins, many minerals function as coenzymes, enabling the body to perform its functions, including energy production, and healing. Because all of your enzyme activities involve minerals, minerals are essential for the proper utilization of vitamins and other nutrients. Some vitamins can be produced by the body, though most come from the foods you eat; minerals come solely from your diet, you cannot obtain them any other way. You must get enough minerals from your food and water sources or from supplementation in order to achieve optimum health. Where do our minerals come from? Naturally Balanced From Utah’s Inland Sea. The strongest, most concentrated mineral supplement you can buy. Through a natural process that removes the sodium, Liquid Ionic Trace Minerals are nature’s balance of ionic minerals that match the body’s system perfectly. Minerals are needed for body maintenance and repair. Liquid Ionic Trace Minerals, taken daily, will help rejuvenate your body’s entire electrical system perfectly. You will feel better and have more energy. These minerals are 99.5% sodium-free with the remaining mineral nutrients concentrated to over 50 times that of ordinary sea water. Due to the purity and high concentration of the minerals, this naturally preserved product has no expiration date. It improves the flavor of the reverse osmosis, de-ionized, or distilled water. Suggested use: 1/2 teaspoon (40 drops) once or twice daily. A 16 oz. bottle contains 192 serving at 1/2 teaspoon per serving At 1/2 tsp. per day and is approximately a 6 month supply. Pregnant and lactating women should always consult with their healthcare professional before using dietary supplements. Just put several drops in your favorite juice and you can boost your energy throughout the day. Use daily for a balance of essential minerals for radiant health. Initial users may consider 1/4 teaspoon twice daily. Mix with liquid (water or juice) or food. Replace lost minerals in distilled water, or improve the flavor of deionized or reverse osmosis water by adding 40 drops of minerals to one gallon of water. Liquid Ionic Trace Minerals are naturally balanced, full spectrum minerals, harvested from the brine of the north end of the Great Salt Lake, located in Utah. The minerals are produced through a solar evaporation and precipitation process. As the water evaporates, sodium chloride (salt) crystallizes and is removed. Almost all the sodium chloride evaporates first, leaving a very low sodium content, and a high concentration of other minerals. 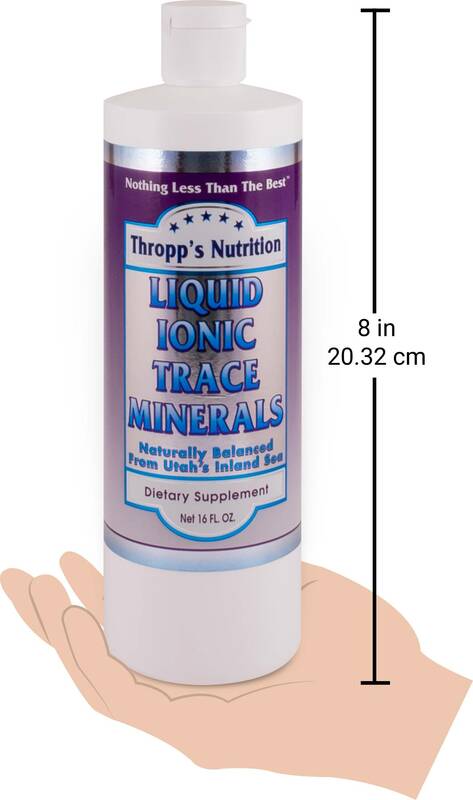 Liquid Ionic Trace Minerals are economical and easy to use. Studies by the National Institute of Health and other private agencies determine that most people do not reach even 75% of the recommended Daily Value percentages for numerous trace minerals. Keeping a balanced level of minerals and trace minerals in every organ and cell of the body may be a prominent factor in maintaining good health. 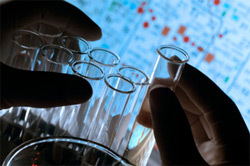 There are two types of liquid mineral products sold on the market. The first type is colloidal, where minerals are suspended in a stable form. In this stable form, the minerals are evenly distributed throughout the liquid in which they are suspended. Minerals in this colloid state are held in large, organized patterns, whereby they remain in suspension without settling out. Colloidal minerals are not readily absorbed by the body due to the absence of an electrical charge and their relatively large size, unlike other mineral forms. In fact, one definition of a colloid is a substance that when suspended in a liquid phase, will not easily diffuse through a living membrane. Colloid arrangements are unable to pass through the membrane which lines the digestive tract, from the mouth all the way out. It is argued that colloidal mineral forms are more easily dispersed in the body; however, this does not improve their absorption. In fact, it is necessary for the body to break these minerals down into smaller constituents in order for them to be absorbed. Manufacturers claim that supplements made from these colloids are more balanced than other mineral supplements and are in a natural form that is easier for the body to use. According to the Food and Drug Administration (FDA) and the American Dietetic Association, no scientific evidence supports these claims. Commercial colloidal mineral products are derived from clay or humic shale deposits and there is a tremendous amount of promotional claims for colloidal mineral products. There is no reliable medical evidence to support using these products. Ionic minerals, on the other hand, are easily transported across the highly selective cell membranes of the human digestive tract. Because ionic minerals are charged, the body has to employ less energy in order to absorb these minerals. Colloidal minerals must be dismantled, into smaller parts, and obtain an electrical charge in order to cross the intestinal membrane. This electrical gradient allows for the easy flow of ionic minerals from an area of higher concentration (intestines) to an area of lesser concentration (cells of the body). The body assists in this process by further charging ions during the course of the digestive process. The body absorbs ionic minerals with greater efficacy than colloidal minerals, as colloids must undergo the complete processes of digestion into smaller charged particles, and even after undergoing these processes; the body utilizes not all of the colloid mineral forms, just as not all foods eaten are completely utilized. Magnesium 250mg 62% RDA, Chloride 700mg 20% RDA, Sodium 9mg less than 1% RDA, Potassium 5mg less than 1% RDA, Sulfate 55mg, Lithium 1.5mg, Boron 1mg. In addition to the elements listed above, this product contains the following in naturally occurring, varying trace amounts: Bromide, Calcium, Carbonate, Fluoride, Silicone, Nitrogen, Selenium, Phosphorus, Iodine, Chromium, Iron, Manganese, Titanium Rubidium, Cobalt, Copper, Antimony, Arsenic, Molybdenum, Strontium, Zinc, Nickel, Tungsten, Scandium, Tin, Lanthanum, Yttrium, Barium, Silver, Uranium, Gallium, Zirconium, Vanadium, Beryllium, Tellurium, Bismuth, Hafnium, Terbium, Europium, Gadolinium, Cerium, Cesium, Gold, Dysprosium, Samarium, Holmium, Lutetium, Thulium, Erbium, Ytterbium, Neodymium, Praseodymium, Niobium, Tantalum, Thorium, Rhenium, plus the other elements found in sea water. Chromium: plays a significant role in carbohydrate metabolism. Chromium enhances insulin sensitivity and sugar metabolism. Cholesterol levels can be lowered with the help of chromium – but chromium levels drop as the human body ages. Magnesium: activates over 300 enzymes and is critical for proper heart function; higher levels may help protect against heart attacks. . Muscles contain 27% of the body’s magnesium. Magnesium protects teeth by binding calcium to tooth enamel. Calcium: is the most abundant mineral in the human body. It is essential for developing and maintaining healthy bones and teeth. Optimal intake helps reduce the risk of osteoporosis. It assists in blood clotting, oxygen transport. Potassium: 98% of the body’s total potassium content is located within the cells. Potassium regulates the heartbeat, maintains fluid balance and helps muscles contract. Deficiency can lead to bone fragility. A high sodium diet with low potassium intake may be implicated in high blood pressure and heart disease. Sodium: is essential for nerve transmission, and is required for proper muscle contractions. Lithium: may play a protective effect in treating sodium imbalances that contribute to atherosclerotic heart disease. Studies also show that lithium can prevent behavioral alterations due to social isolation and confinement. Copper: is found in the highest levels in the liver and the brain. It helps many of the body’s enzyme systems. It acts as a catalyst to store and release iron to help form hemoglobin. Iodine: Needed by the thyroid hormone to support metabolism. Sulfate: plays a critical role in liver detoxification. It is needed for structure of most protein, including muscles and hair. Iron: An important mineral for proper brain function, iron is also necessary for red blood cell formation and function. A deficiency will lead to anemia. Chloride: is a component of stomach hydrochloric acid. It helps regulate the body’s acid base pH. Chloride is absolutely essential for hydrochloric acid production, which usually decreases with age. Manganese: is essential for healthy ligaments and connective tissue. Without proper manganese levels, protein digestion is compromised. Phosphorus: works with calcium to develop and maintain strong bones and teeth. Many B vitamins are activated only in the presence of phosphorus. Selenium: is essential for glutathione metabolism. It can lessen the toxicity of heavy metals, such as mercury. Selenium provides protection against cardiac damage. Zinc: is essential for growth and physical development. People with a zinc deficiency often lose their sense of taste. It is vitally important to the immune system, and is involved in every enzyme reaction in the brain.